The UK festival scene has never been so exiting. As soon as you hear the word festival, it conjures up thoughts of a very muddy Glastonbury, V Festival (split between north and south) and the classic Isle of White Festival, if you’re putting on an event in the UK it is mindful to consider the other 453 regular festivals which happen throughout the year – will a local event clash with yours? We have provided toilets and sanitation services the length and breadth of the UK since 2003 and we have supported a number of festivals and events – so we are qualified to discuss your requirements. Festivals are fantastic events where we get to celebrate a commonalty, a theme and or something we enjoy collectively. Varied in size festivals range from small niche events to massive multiple venue, multiple day events. The subject of which can vary from genres of music (pop, punk, alternative, folk, classical, jazz, metal), food persuasions (cheese, BBQ, artisan, pie, beer, wine) to human interest type occasions including reading, arts, history, ghosts, cars, trucks, camper vans, bikes, air – shows and the like. Back in 2013 there was a glitch in supply as the country played host to the Olympics. 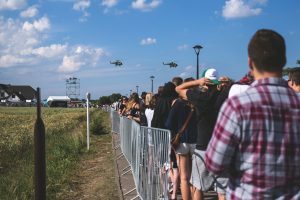 This caused a nationwide shortage of portable toilets causing Glastonbury to be cancelled and for other events to concern about the availability of facilities. Of all the 456 annual events there is always a requirement to ensure that guests are catered for accordingly as everything is about the experience. Here are some tips on providing the correct level of facilities. When planning an event, know how many people you anticipate attending, then add some more toilets for comfort and allow for “human challenges”*. Are any of your festival goers young families and have you adequate disabled provision? What shower facilities will you be providing? How will you treat your performers and VIP’s? What about providing toilet facilities for your volunteers and staff? Where your toilets are located is crucial to making your guests feel welcome. Consider the needs of individuals and gender. Long gone are the days when a row of portable toilets is sufficient for a successful event. Consider providing gender or family friendly bunches of toilets so no one feels isolated. You also need to consider what is close to your toilet facilities, site your toilets away from your food stalls but not too far! Planning a big festival? Then consider placing some toilets outside of your turnstiles/main entrance to ensure your guests are well looked after? What about the land and access? Installation, servicing and recovery of your toilets requires adequate access. Try and site your toilets where vehicle access will not add to the muddy quagmire generated by thousands of wellington boot clad festival goers. The Great British Weather is famed for not being favourable to our festivals and whilst there are exceptions, plan for inclement weather and everything else is a bonus. To grasp the complexities of providing toilet facilities for your event, the next step would be to give our team a call and understand exactly what you need and how we can ensure everything goes according to plan. Contact our team today on 0330 111 0259 and start planning your event with confidence. *Human challenges, people are people and whilst being very human in nature they do sometimes have problems with and in toilets. This can mean that your planned capacity of toilets can be reduced. Always plan to have a selection of toilets in reserve as a back up plan. Take into account emergency cleaning or incidents of “Dixy tipping” (the boisterous activity of tipping a portable toilet whilst there is an occupant on the inside).